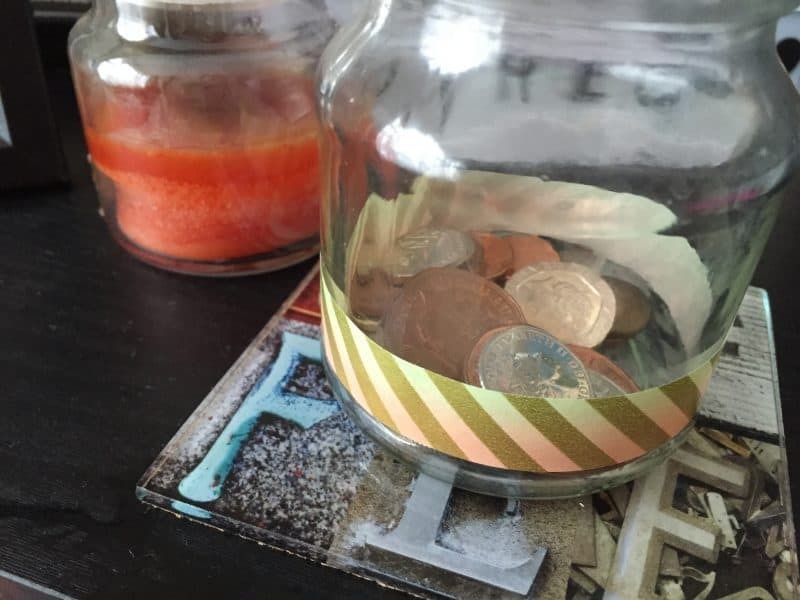 One of the best things I ever did for my finances was start a penny jar. Okay, so… I know that sounds really dramatic… but hear me out on this one! I can be a super neat freak when it comes to my personal possessions. I keep my handbag and purse immaculate; there is not a stray receipt or food wrapper in sight and there is nothing I hate more than a purse full of ‘shrapnel’. So a few years ago I started chucking the excess into a pot and I haven’t looked back since! My favourite thing about it is always the surprise of how much is actually in there when I go to cash it in. It sounds crazy, you’d think a bunch of 2p and 5ps wouldn’t equate to much but they totally do! So with all that said… here’s my top five ways to get that penny jar working for you! Start with a smallish jar. I’m no psychologist but I know that if you start tossing loose change into a large jar, it’ll feel like it is taking forever and you might get disheartened. So start small and you’ll feel pretty good when you start to see it fill up! Once my little jar starts getting full I tip the contents into a large pot hidden away in my cupboard. When that bad boy is full I know it’s time to cash in! Kaching! Make sure it’s somewhere you’ll see it often! By your kitchen sink, next to your keys in the hallway… anywhere you’re going to cast your gaze over it on a daily basis! That way you’ll be reminded to pop your excess change in it as often as you choose. I aim for a clear-out every Friday (as I often need change in the week for school)! Set some rules. Obviously you can do whatever you like when it comes to your money and your savings but I think it’s always good to set some rules. My personal thing is that everything 20p or smaller goes into the jar. Stick with whatever works for you, your budget and the amount of cash you tend to carry! Top it up! Work in a job where you get tips? Don’t be tempted to spend them if you don’t need to, pop them in your jar and give it a healthy boost! Same for scratch card wins… or what about a cheeky payday boost? Get paid and pop an extra fiver in the jar to get it growing (don’t be tempted to dip into it though)! Start an online penny jar. With online and mobile banking it has never been easier to open a savings account! I have a little online savings account that gets topped up every time I log into my online banking. What do I top it up with? The odd pennies on my bank balance, of course! I always round my bank account balance down to the nearest pound (or sometimes nearest fiver if I’m feeling flush) and pop the excess into my savings. This is a fantastic way to stay motivated as you can see the value grow in real time, perfect if you’re saving to a specific goal! This post was written by one of my blogging pals who is now a real life pal Clare. She has had a couple of blogs over the past but is now blogging at So We Did… and you can find a lot more helpful posts over there from the queen of money saving, plus her two cute as a button little kids! She’s on twitter too! I have a penny jar but it is indeed taking a lonnnnnng time to fill.